For one night only, Bob Robertson and Linda Cullen will host “An Evening of British Music Hall” on stage at Barkerville Historic Town’s Theatre Royal on Saturday, August 21st. The comedy duo is best known for the Nellie Award-winning comedy series Double Exposure, which debuted on CBC Radio’s national network in February 1987. Initially, CBC had ordered only 13 episodes, but midway through the first run decided to expand the number of weekly shows. After only a couple of years it was running every Saturday morning on CBC Radio One and repeated Sundays on Radio Two in the afternoon. During the summer, it was repackaged into a series of “The Best of Double Exposure.” By August 1997, Double Exposure had produced more than 400 shows. During the 1980s and 1990s, Double Exposure was nominated for a number of awards, including the ACTRA Radio Awards (also known as the “Nellies”). In 1990, Double Exposure won the Nellie for Best Comedy. In 1995 Robertson and Cullen began writing, performing and producing an annual New Year’s Eve comedy special for CBC called “A Swift Kick in the Year End.” The special ran for three years and boasted exceptional ratings of over a million viewers each year. In 1997, after ten and a half years on CBC Radio, Double Exposure moved to CTV and the Comedy Network with a weekly half-hour comedy show. By the time it ended its run three years later, the TV series had garnered a number of awards and nominations – including the Chrysler Canada People’s Choice Award, presented annually to the six top-rated Canadian programs on television. In 2004, Robertson and Cullen were inducted into the BC Entertainment Hall of Fame, along with such stars as Randy Bachman, Terry Jacks, and Janet Wright. Their names can be found on the Walk of Fame across from the Orpheum Theatre on Granville Street in Vancouver. 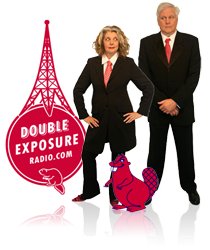 Today Double Exposure continues to entertain Canadians and people all around the world with a weekly comedy pod-cast, Double Exposure Radio. Much like the material Robertson and Cullen performed weekly on CBC Radio, the show is loaded with topical satire of various newsworthy events of the week. It can be found at www.doublexposureradio.com. And now, for one night only, these Canadian comedy legends will appear on the stage of Newman and Wright’s Theatre Royal in Barkerville, BC, as part of the 12th Annual Mid-Autumn Festival. The show begins at 7 pm on Saturday, August 21st. It starts just after the finish of first sitting of a fabulous celebratory banquet at Barkerville’s Lung Duck Tong restaurant, and ends in time for the lantern parade. For more information about “An Evening of British Music Hall” or to reserve tickets, please contact Barkerville’s Theatre Royal at 250-994-3225. To reserve a seat at the Lung Duck Tong’s Mid-Autumn Celebration Banquet, please phone 250-994-3458. 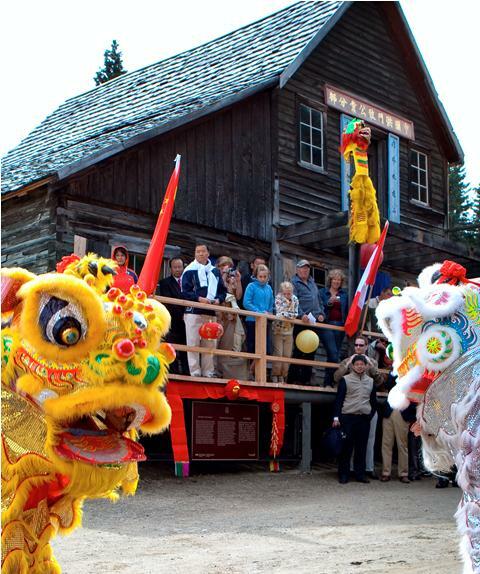 Barkerville Historic Town possesses a rich Chinese heritage and a vast collection of Chinese architecture, artefacts, archival material and photographs. On Saturday, August 21, Barkerville will celebrate Mid-Autumn a little early – early enough in the season that is to share this special day with the town’s summertime guests. There will be a variety of activities and entertainments to observe Mid-Autumn Festival, and to commemorate Barkerville’s Chinese-Canadian pioneers. The day will be filled with lion dances, lantern-making, a tea ceremony, games for all ages, moon cake tasting, and more. A special celebration banquet, featuring sittings at both 5 pm and 7:45 pm, will be hosted by the Lung Duck Tong restaurant. At dusk visitors can venture out under the stars for a parade of illuminated paper lanterns, enjoy a show presented by dedicated Wells-Barkerville volunteers and, weather permitting, finish the evening with a beautiful fireworks display. According to ancient Chinese astrology, the moon is at its roundest in the middle of the autumn season. Since the round shape of full moon symbolizes family reunion and togetherness in Chinese culture, one of the pre-eminent festivals in the Chinese calendar is celebrated on this day. It is the Mid-Autumn Festival, the second most important occasion in China after the Lunar New Year. The Mid-Autumn Festival is also known as the Moon Festival. During the festival, family members gather to eat moon cakes and appreciate the bright full moon – an auspicious token of abundance, harmony and luck. People who are away from home will express strong yearnings toward their native soil and sadly miss those family members who live far away. This was especially true for the lonesome Chinese pioneers working and living in Canada during the Cariboo gold rush. They left their families on the other side of world and worked industriously in the goldfields in pursuit of a better life for their loved ones. A line from traditional Chinese verse, “the moon at the home village is exceptionally brighter,” expresses the nostalgic feeling of these Chinese sojourners. Their hard work and sacrifice have been recognized as an irreplaceable contribution in forming the Canada we know today.